Before I get too far into this post, the important thing to know about this year's nationals was that I really did enjoy myself. I enjoyed seeing friends I don't see all that often. I enjoyed watching world-class dancers. 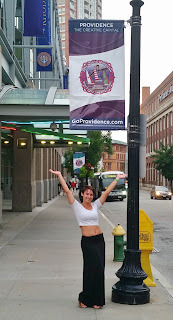 I enjoyed the small bit of exploring I did of the charming Providence. I just fear that a lot of this post is going to be talking about the not-so-good parts, so I wanted to state that first and foremost. 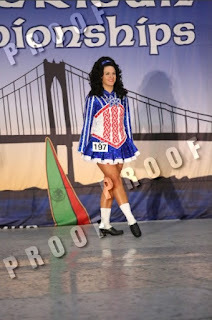 Dancing day came around and I was very calm as far as major dance competitions go. Usually I get myself so worked up about 'this is the chance to get that world qualification, so you better do your best,' but not that day. Senior ladies ended up scheduled for July 4th this year, and so my dress received a lot of compliments, and the occasional question about if I ordered a patriotic dress specifically for the day. I was towards the beginning of the hornpipe round, which was very nice to get it done and over with and not have to wait around for two hours! 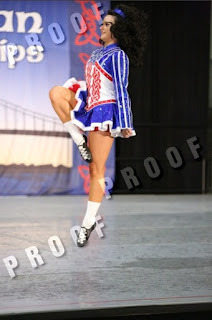 The downside to that was that my hornpipe really wasn't the best. I over-taped my shoes because I psyched myself out from hearing about how slick the floors were, so my shoes felt sticky. There were screens on either side of the stage broadcasting the dancing to the back of the hall could see, and as I turned to the side on my second and third steps, I could see myself on a one second delay, which threw me off. But I smiled the whole time through! There was a five hour wait between rounds for me, so after warming up again, I did dance what I felt like was a great reel. I was very proud of how that round felt, and knew that the rest was in the judges hands for the day. I didn't recall, but that was really okay. I of course waited around the dancing hall until the awards were given out, and immediately went to purchase the results for my competition upon the completion of the senior lady awards. I was extremely disappointed to find that I ended up tied for 83rd place with many others because we were awarded 0 Irish points. I knew that my hornpipe wasn't it best, but I would have thought my reel at least would have gotten me something. So I basically got last place. For the third competition in a row this year. I think part of the issue is the steps I got in January this year are of a completely new style that I've ever done before. I am especially struggling with the hornpipe and the set. Despite six months of drills, the hornpipe still feels awkward and gets very little sound. 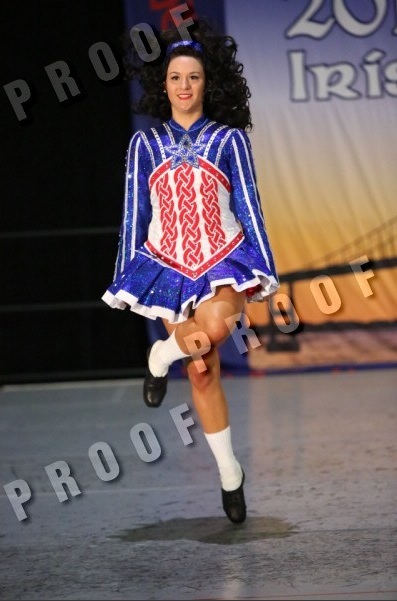 Everyone who is an open champ at my school has these same steps, and I'm realizing more and more that Irish dance steps are not one size fits all. 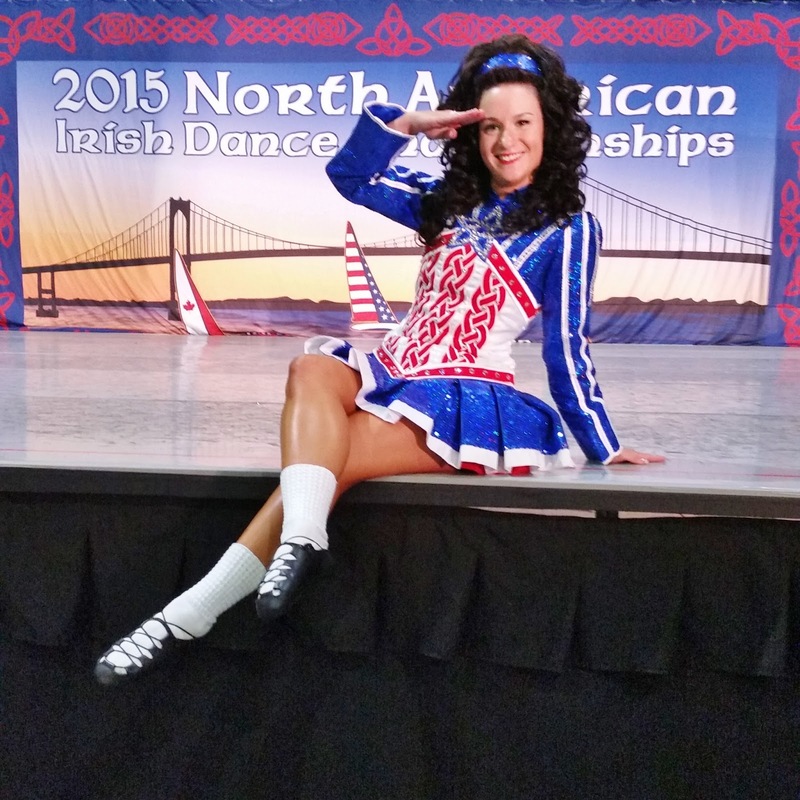 I will be asking my TC to see if I can do something that I can pull off consistently, so I can achieve that long-time world qualification goal at Oireachtas. I thought part of the reasoning for this string of last place was my feis look being too progressive. You know, the no wig, pixie cut, with red or blue bangs to match my dress. I get lots of complements on my hair choice from other feis goers, but through that may have been a factor in my recent last places. After wearing a gorgeous full wig and seeing no improvement, I don't think that's it. 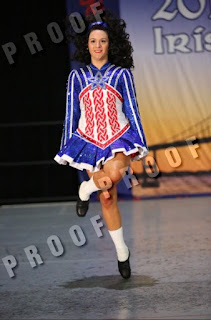 In other news, I leave in a few hours to take part in the inaugural Riverdance Summer Academy in Dublin. There will be WiFi, so I hope to post on Rince go Bragh from Ireland, and possibly from my vacation in London, too! I will for sure be updating the Rince go Bragh Facebook page while I'm there, so make sure you have liked that page to keep up with this fantastic opportunity! 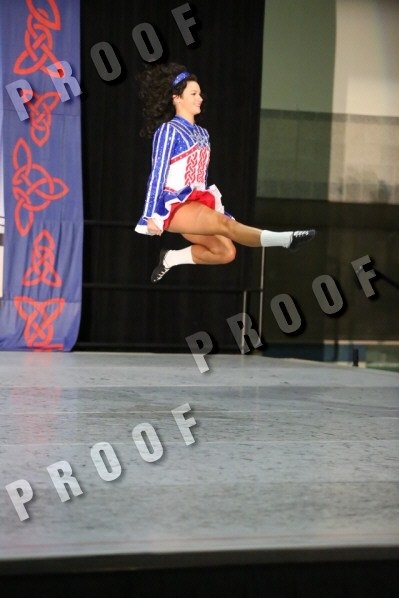 Goals: Have the best time with Riverdance! Happy Birthday Mr. Theodor Seuss Geisel!! !